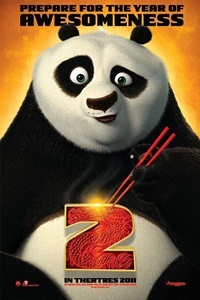 Kung Fu Panda 2: (Scheduled) US, Animation/ Action/ Adventure/ Comedy/ Family – Jack Black, Angelina Jolie, and Jackie Chan lend their voices to the characters in this sequel to the very popular first installment. Po is now living his dream as The Dragon Warrior, protecting the Valley of Peace alongside his friends and fellow kung fu masters. But Po’s new life of awesomeness is threatened by the emergence of a formidable villain, who plans to use a secret, unstoppable weapon to conquer China and destroy kung fu. It is up to Po and his friends to journey across China to face this threat and vanquish it. But how can Po stop a weapon that can stop kung fu? Sounds awesome, and I thought the first film was a real hoot, so I’m looking forward to this. And the 3D has gotten some excellent comment. 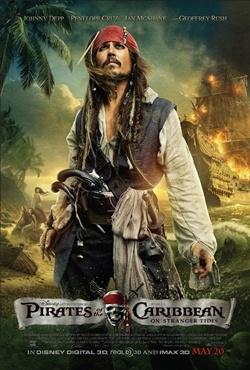 Pirates of the Caribbean: On Stranger Tides: US, Action/ Adventure/ Fantasy – The latest in this great pop series, with a shipful of grand scenery-chewing British star swashbucklers. This time, Captain Jack Sparrow (Johnny Depp) crosses paths with a woman from his past (a delightful Penelope Cruz), and he’s not sure if it’s love — or if she’s a ruthless con artist who’s using him to find the fabled Fountain of Youth. Very enjoyable – the stars are terrific, and the jokes and set pieces are funny and well done. If you liked what went before in the series, you’ll like it again. Mixed or average reviews. 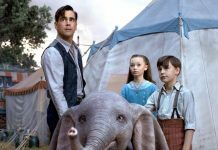 According to Disney, the movie was filmed using 3D cameras, but the special effects were rendered in 2D and then converted to 3D to keep the budget down. I saw the 2D version, and thought much of it way too dark visually, to the point where you really had difficulty seeing what was going on . In 3D this must be much worse, as things in 3D tend to be much darker and muddier than in 2D. Both versions are at Pattaya Beach, only 2D elsewhere, and the version at Big C is Thai-dubbed. Ladda Land: Thai, Horror/ Mystery – A very popular Thai movie. A family moves into a new house in a Chiang Mai housing development where the newcomers gradually begin to encounter horrifying paranormal events. It’s the creation of the Thai filmmaker I think is at the top of the list for horror and spookiness at this time, 30-year-old Sophon Sakdaphisit. He’s the man responsible for some of the most enjoyable parts of recent anthology films (like 4Bia and Phobia 2) and as writer and/or director for some of my favorite Thai films: Alone (the identical twin caper), Coming Soon (people sucked into a movie), and the iconic Shutter. This time, in addition to the spookiness, he seems to have added a level of social commentary, as this family is beguiled into accepting the lures of the middle-class lifestyle to which they are not accustomed. It is said that the tale behind this film is based on fact – a housing development in Chiang Mai was eventually abandoned after a series of unexplained deaths. Rated 18+. English subtitles at all locations. The Ward: (Still may show up) US, Horror/ Thriller – An institutionalized young woman becomes terrorized by a ghost. A neat little horror flick by a master of the genre – John Carpenter – that isn’t perfect and not the scariest or most imaginative, but a middling shocker salvaged by the director’s class, and with some finely crafted shocks and a steady pace that almost seems stately in these days of fast-cut horror. Rated R in the US for violence and disturbing images. Mixed or average reviews. Priest: US, Action/ Horror/ Sci-Fi/ Thriller – The word on this film is decidedly not kind – but there were things that I liked very much: the performance of its star Paul Bettany, an actor I appreciate very much; the visuals/ art direction, which were carefully and craftily done to establish a good tense mood full of foreboding – and in general the sense of style throughout. Strangely, it’s essentially a black and white film – and it opens with a terrific animated short which explains the background of the film, establishes the role of the priests, and sets the scene of this alternate universe where vicious vampires have been at war with mankind for centuries. The Church – headed by Christopher Plummer, no less – has become all-powerful due to its ability to keep the vampires at bay. As of yesterday it’s been showing in 3D at Major, 2D elsewhere, and the version at Big C is Thai-dubbed. The 3D is “conversion” 3D, and I think not that impressive. Mixed or average reviews. Thor: US, Action/ Fantasy – Directed by the top Shakespearian director of our time, Kenneth Branagh – slumming, as it were. Thor, a powerful but arrogant warrior-god as imagined by Marvel comics, is sent down to Earth as punishment for reigniting a reckless war. Mixed or average reviews. Only 2D now, not at Big C, and may have departed everywhere. E Nang / I Love Farang / White Buffalo: Thai, Comedy/ Romance – Set in the northeast of Thailand or “E San” (as this film would have it) where, they say, some girls are fond of dating western guys, and for some families having a Western son-in-law is now the trendy thing to do. Fast & Furious 5: US, Action/ Crime/ Drama – Vin Diesel and his crew find themselves on the wrong side of the law once again as they try to switch lanes between a ruthless drug lord and a relentless federal agent. It’s a movie that’s proud of its brainless action thrills – sleek, loud, and over the top, and the most exciting of the series. Generally favorable reviews. At Big C it’s Thai-dubbed only. Jakkalan: Thai, Action/ Comedy – ‘Jeeja’ (Chocolate and Raging Phoenix) is back in a new action comedy directed by an acclaimed director Petchtai Wongkamlao, aka Mum Jokmok. The lives of an uncle and his niece Jakkalan turn into chaos after she is hired to transport smuggled goods to ruthless gangsters. Not at Major, and may have departed everywhere.